4-inch tall papercraft figures inspired by the Marvel film Iron Man 3! 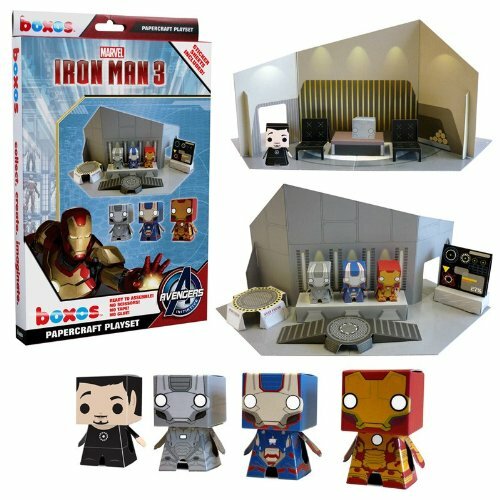 Set contains Tony Stark, Iron Man Mark, Iron Patriot, and War Machine papercraft figures. No tape, scissors, or glue are necessary to make the Tony Stark Lab or the Tony Stark Penthouse Suite! Ages 3+ Front inside the papercraft playset features the Tony Stark Lab while the back features the Tony Stark Penthouse Suite! This set includes 4 papercraft characters that stand 4-inches tall each: Tony Stark, Iron Man Mark 42, Iron Patriot, and War Machine. Re-enact your favorite scenes from the Marvel film Iron Man 3 in papercraft style using the Iron Man 3 Movie Boxo Papercraft Playset! 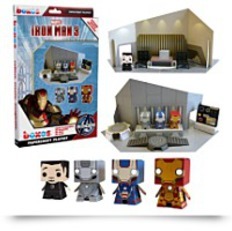 The back of the Iron Man 3 Movie Boxo Papercraft Playset features the Penthouse Suite while the front features the Tony Stark Lab.